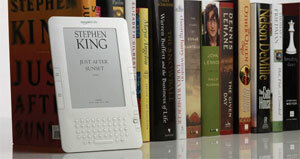 Dorchester Publishing Inc., one of the country’s oldest mass paperback publishers, is going to stop publishing books in the traditional means this Monday, possibly signaling the biggest shift to e-readers that we have seen yet. According to The Wall Street Journal, Dorchester’s sales fell 25 percent this year on declining orders from accounts such as Walmart. The publisher has traditionally published 25 to 30 new titles a month, mostly in the romance category, and those readers have become fans of the e-book format as it means they can read them in public without anyone seeing the usually very salacious covers. Dorchester will continue to do print copies for its book club business and has signed a deal with Ingram Publisher Service for IPS to do print-on-demand copies for selected titles. According to Prebich [president of Dorchester], some e-books that are doing well in the digital marketplace will be released as trade paperbacks with IPS fulfilling orders; the company, however, will not do any more mass market paperbacks for retail distribution. This is a huge move for any publisher to make as e-readers aren’t the deeply integrated into the marketplace yet. The company says it has seen “remarkable” growth, but at this time digital sales only accounted for 12 percent of the company’s sales, but they do expect to see that double over the next year. Of course they will see a major reduction in costs from raw materials, transportation, storage, returns and so on, but that is still going to be a lot of sales to make up for the company to stick in the area it has been used to. The books will be platform agnostic meaning they should be for sale in all the major e-book stores, and will sell for $6.99 each for the usual novels, and $12 to $15 for the larger collections. President Prebich told Publisher’s Weekly, “These are like pioneer times in publishing. We felt like we needed to take some chances and make a bold move.” Well, we can’t argue with the idea of it being ‘bold’, but we might have replaced that with ‘crazy’. We could see this happening a year or two down the road, but for now it just seems a little too much ahead of the curve. What say you? Do you think they’ve jumped the gun?